While there is a general consensus that the selfie, in all its duck-faced glory, displays the narcisstic, self-indulged tendencies of today’s youth, there is no denying the significant impact this new genre of ‘art’ is having on photography and meaning itself. Jerry Saltz describes how the #selfiemovement is changing the way in which we communicate. Selfies provide instant visual communication and imply, “control as well as the presence of performing, self-criticality and irony.” Selfies are an intrinsic part of creating a digital avatar- the ‘virtu-real’ you. A relatively new selfie-nomenon is what we will call in this blog the ‘historical selfie’: there are scores of selfies taken at heritage sites of historical significance around the world. Some of these selfies are causing controversy, in particular those taken at sensitive locations such as Auschwitz and the 9/11 memorial in New York. 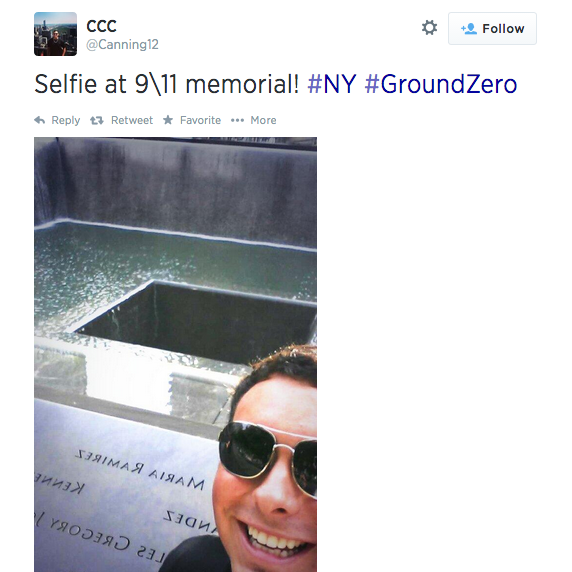 These selfies are seen by many to violate the solemnity and respectful memory inherent to these sites. However, we cannot always be so quick to judge the nature of these photos as disrespectful. Thomas P Thurnell conducted a study in 2009 on youth visiting Auschwitz. His findings displayed that every person who took a photo at the camp did not have a desire to convert the site into a spectacle, but rather to create a meaningful documentation of their personal experience. As such, perhaps these selfies convey an attempt to connect time and historical significance in a process of place-making, as Elizabeth Losh writes, allowing the sense of a place to be constructed around a tourist’s personal context and insights. A perfect example of selfies having the ability to encapsulate such profound meaning can be found on the Tumblr blog Selfies at Serious Places. In line with the name, here selfies from ‘serious’ locations around the world are published; however the artists are given the opportunity to explain the meaning behind their photos. 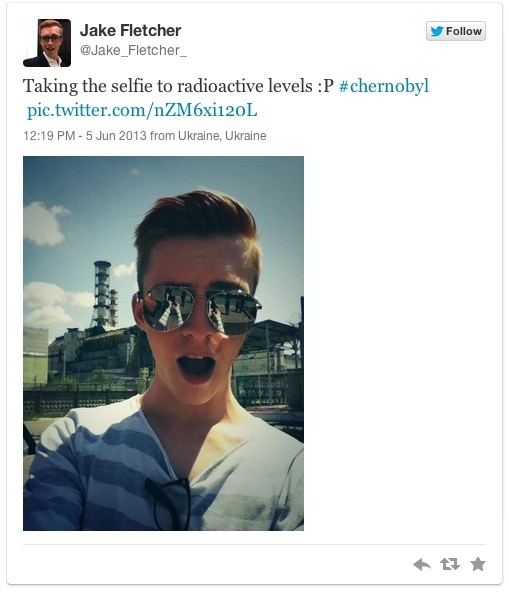 One photo, taken by Jake Fletcher, shows Jake standing; mouth agape, in front of the Chernobyl reactor in Ukraine. It was here in 1986 that a catastrophic nuclear accident occurred, with the ensuing contamination affecting an estimated 500,000 workers. Jake’s caption reveals a more meaningful evolution of selfies. That expression on my face is meant to be shock, not some vacuous, feeble attempt at narcissistic irony… I hope that some people will now think about images like mine for just a bit longer before bemoaning that they show society’s failures laid bare before them. Jake’s profound comments demonstrate that we cannot so easily dismiss the selfie as an act of narcissistic self-affirmation in a digital world dictated by a currency of likes.